Did you lose Windows 7 password? Have you forgotten your Windows 7 password? Follow the guide in resetting Windows 7 password to gain access again to Windows 7. When installing Windows 7 the first time, the setup will prompt us to create a user account and password. The password ensures that only you have access to your user account or user profile. If Windows 7 is installed already, when you first turn on your new computer, you will still be prompted to setup a Windows login credential. It’s a rule of thumb of remember the password and keep it private by not sharing it to anyone. However, there are end-users who forget their Windows 7 password, so we’ll discuss on this article on what to do if you lose your Windows 7 password. If you forget Windows 7 password and received an error message that the entered user name or password is incorrect, Windows will display the password hint. Try remembering the password using the hint that you’ve created. 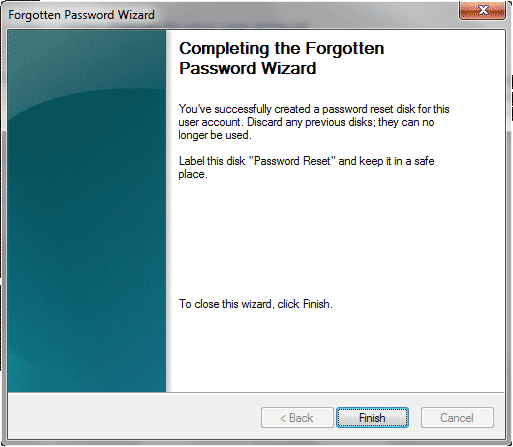 If you really cannot remember your password, and you have created a password reset disk, click “Reset Password” on the login screen and follow the instructions when Forgotten Password Wizard is displayed. There’s no Password Reset Disk? Not everyone created Windows 7 password reset disk which means your account is locked and you have no access unless you have another administrator account. Try to login using another administrator account in Windows 7 (it can be another admin user account that you’ve created before or the default but hidden administrator account that you’ve enabled), select Start button, type lusrmgr.msc in the Search box and press Enter key. The Local User and Groups console will be displayed. Select “Users” in the left pane. Right-click the account that you need to reset the password for, and click Set Password. Type and confirm the password. Note that resetting the password in Windows 7 using another administrator account has impact: You will lose access to encrypted e-mail messages, stored password for websites and encrypted files on that account that you reset the password for. If your emails and files are not encrypted, you are not affected. What if there’s no other administrator account in Windows 7 to reset a password? 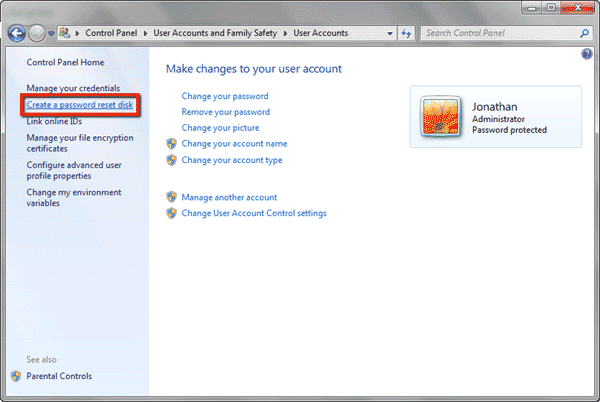 The worst scenario is you did not enable the default but hidden admin account in Windows 7 or you don’t have another account with administrator permission. Don’t worry, because you can try another method to reset when you lose your Windows 7 password by using a third-party password utility software: Password Recovery Bundle. 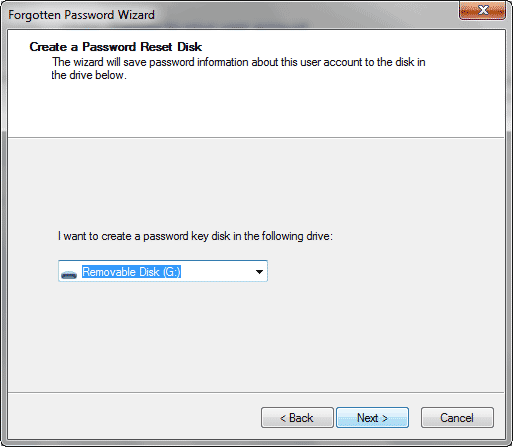 To prevent from losing your Windows 7 password again, take advantage of the password reset disk in Windows. 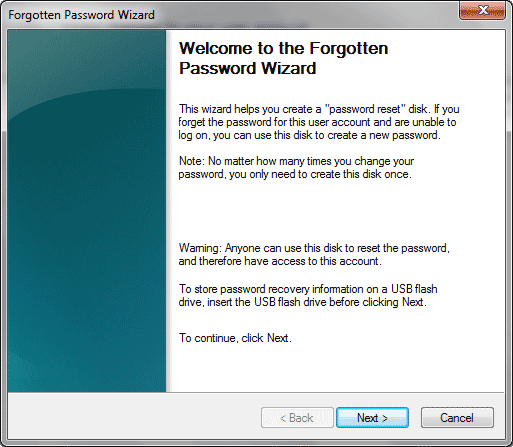 The Forgotten Password Wizard will create a userkey.psw file in any removable drive of your choice so you can use to reset a forgotten Windows 7 password in any event. This will save you time and trouble in case you’ve forgotten your Windows 7 password. Forgot Admin Password for Windows 7 64-bit PC? Forgot password to Windows 7 64-bit Dell Laptop, please help! I am a novice in the IT world, the password I picked is pretty good but I locked myself out of my laptop. I have tried everything with no luck. Forgot the admin password for your Windows 7 64-bit PC? Your kid changed your admin password and now has no idea what he changed it to? Many people face this problem you are not alone. There are many tricks and tips on what to do when you forgot admin password. Unfortunately, most of them are based on Linux bootdisk and all procedures are too complicated for Windows users. Luckily there is a boot-disk utility based on Windows PE that allows you to reset your forgotten admin password for Windows 7 64-bit computer, It has a simple graphical user interface that even the computer novice can get it to work! The software is Reset Windows Password. Let’s see how can you use it to reset forgotten admin password on Windows 7 64-bit desktop and laptop computers. Forgot Admin Password for Windows 7 64-bit PC? How to Reset the Password Easily? The password-resetting procedure can be divided into 3 steps. It should be the simplest solution for you to regain access to your Windows 8/7/Vista/XP/2008/2003 64-bit operating system. Once the password reset disk is created successfully, you can then use it to boot your locked computer and perform password resetting. Now you need to set your locked computer to boot from the password reset disk you’ve created. 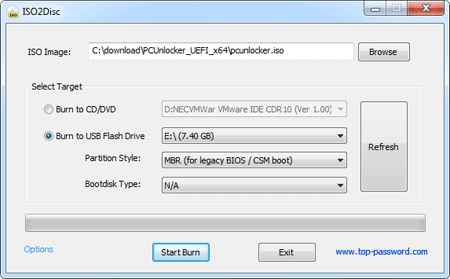 Booting from a USB thumb drive can be done fairly easily using BIOS settings. Every BIOS is a little different, though you should be able to access it using the instructions that appear on screen when you first power up your machine and find a boot order or option to select boot device. Holding DEL or F12 when rebooting can usually get you where you need to be. Some systems are different, however. Once you’ve configured the locked computer correctly, plug in your USB thumb drive and turn on the computer. It will boot from the password reset disk. Once the boot procedure is complete, it will launch the Reset Windows Password program. This is the software you’ll need to reset your forgotten admin password on Windows 7 64-bit PC. The next step is to unplug the USB thumb drive and restart the computer. You can then log in to your Windows 7 64-bit system with a blank password. If you don’t have a USB thumb drive, you can also use a CD or DVD to follow the steps above to reset your forgotten admin password. Enjoy! Got a heck of a deal on a netbook the other day as someone forgot the admin password on Windows 7. I didn’t really thing about it till I went to change it and it dawned on me the thing don’t have a CD-ROM! I’ve used the NT offline password and registry editor before on a few different computers but I don’t see a way to use it on something that only has USB ports. Any ideas on how to make it work? Anyone know of a bootable USB flash drive with such software on it? Forgot Windows login password and you are unable to log onto your netbook? You may have read through many password cracking tricks to no avail. As netbook doesn’t have CD-ROM, we can’t reset Windows 7 password with a CD or DVD. To unlock Windows password and regain access to your netbook, you need to create a bootable USB flash drive, then get your netbook to boot off it and reset Windows 7 password. 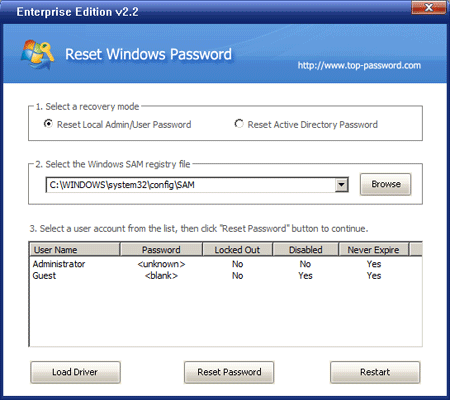 You’ll need to create a Windows 7 password reset USB using another PC. If you don’t have another PC, you’ll have to bug one of your friends to use theirs. Download the ISO image of Reset Windows Password utility, then burn it to a USB flash drive with ISO2Disc. Plug your newly created USB flash drive into your netbook and power it up. In order to go into the BIOS settings, hit F2 as it is starting. Once you are in the BIOS settings, navigate to the Boot tab and move ‘USB-HDD’ to the top of boot priority order list. Hit F10 to save your settings. After booting your netbook from the USB flash drive, the bootdisk will launch the Reset Windows Password utility. On the main screen, you can see the Windows SAM registry file and a list of Windows user accounts. Choose your desired user account, then click Reset Password button. The program will reset your forgotten Windows 7 password and unlock the account if it is already locked out. Reboot your netbook and remove the USB drive. Now you can log in to your computer with an empty password. A password reset USB could really come in handy if you ever forget your account password. With it, you can easily reset Windows 7 password and get right in to your PC. In Windows 7 there is a feature under User Account in Control Panel that allows you to create a password reset disk, what it does is simply create an encrypted key and store that key on a removable media. It can be used when you literary forgot your password of this account that you login to Windows 7 and all you need to do is have this piece of removable media available insert it into your Windows 7. It will then let you reset the password if you have the right encrypted key. It’s a good idea to create one for yourself or for your elderly parents who tend to have bad memories on their password. Otherwise you will get an error like this. 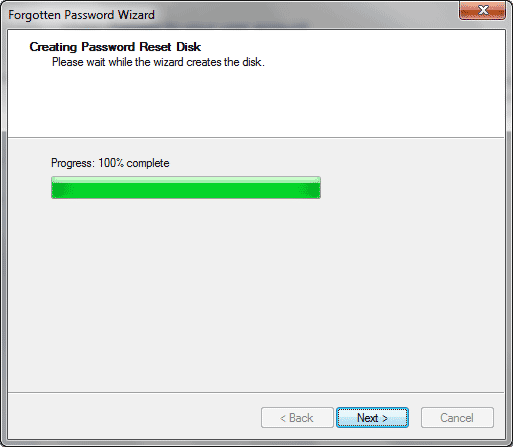 Once you have the USB stick ready, insert it to your machine and proceed to the next step of the wizard. Since it’s already 2011 I wonder what kind machine will even have floppy disk. So I used a USB disk as an example here. It will ask you to type the current password for the account that you are logged in to check and generate a encrypted key and store the key on the USB stick. Once it’s finished you are safe to remove the USB stick. The only thing you need to make sure is don’t lose this USB stick ! Now you can click on “Reset password” in the login screen of Windows 7 if you’ve typed your password wrong or forgot your password. 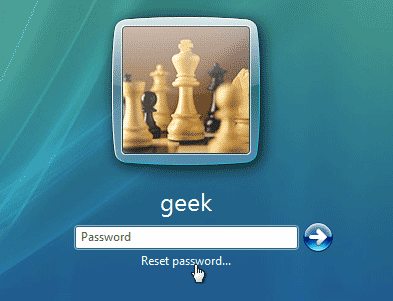 Note: Forgot Windows 7 password and don’t have a password reset disk? 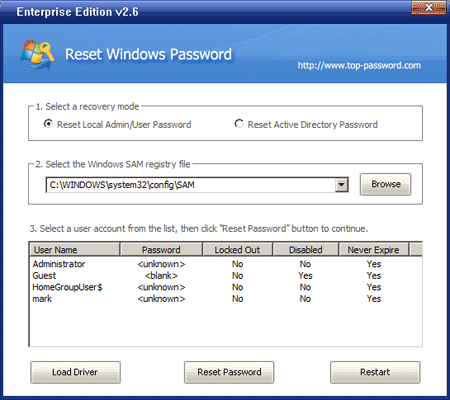 You can still reset Windows 7 password by using a professional Windows password recovery utility – Reset Windows Password, which allows you to create a universal password reset disk for removing forgotten Windows login password on any computer.